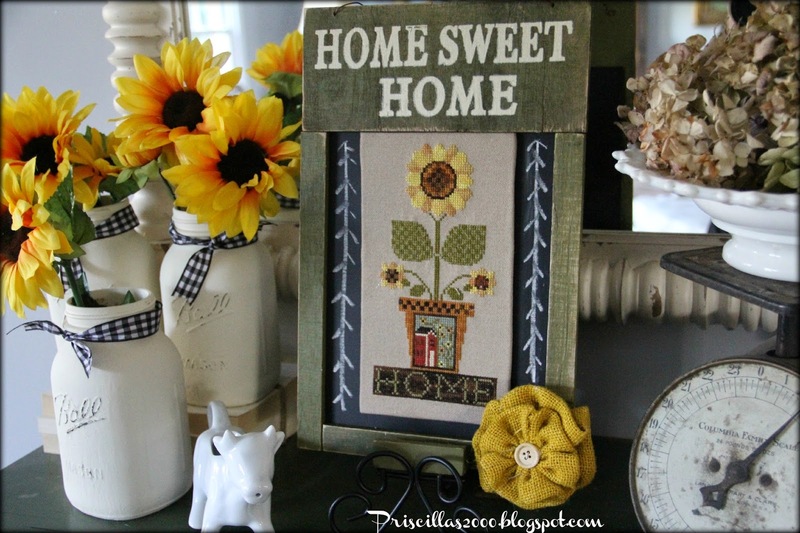 Last night I finished stitching this Little House Needleworks design ..Home is Where The Sunflowers Grow ..I just love it ! I put it on the cabinet in the foyer , its perfect for this time of year ! I had to find a way to display it , I didn't just want it in a frame. I went to Michaels and found this cute little chalkboard. 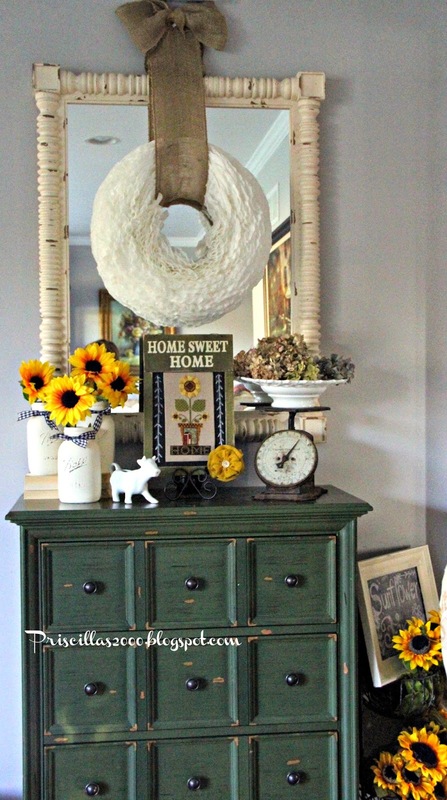 Down in the corner of the chalkboard is a wooden apple , so I got the burlap flower to cover that up. 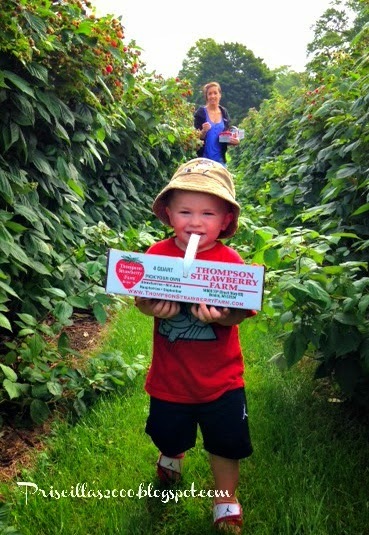 I love it with the painted Mason jars with the black and white check ribbon ..
We went raspberry picking Sunday .. Look at this cutie ,,he had a lot of fun , picking , eating and running around :) Can you believe how tall those raspberry bushes are ??? I took this in my garden yesterday with my I phone .. The butterfly didn't mind that I was standing right in front of it ! 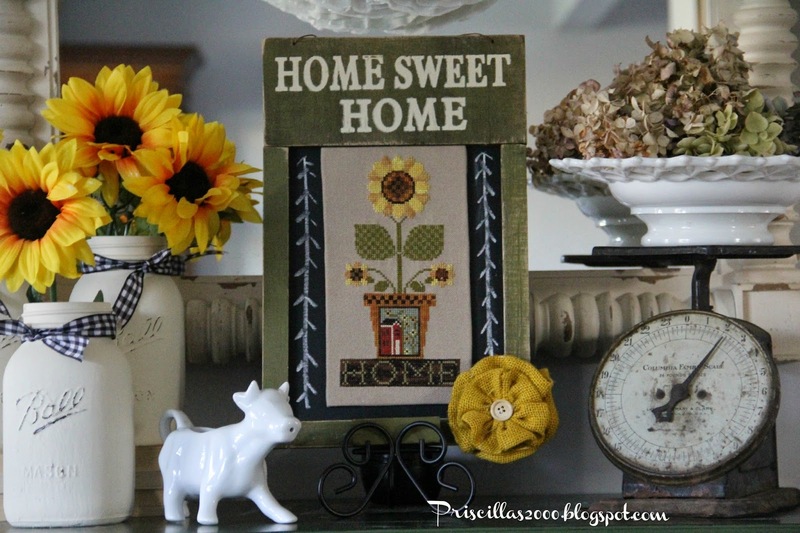 I love that sunflower chart! What a cute little guy! I love your most recent stitchery project. Is that cross stitch or stitchery? Looks darling the way you have it displayed! Loved the pics picking berries. And your flowers are just stunning. Mine never looked anywhere near that pretty this summer!!! 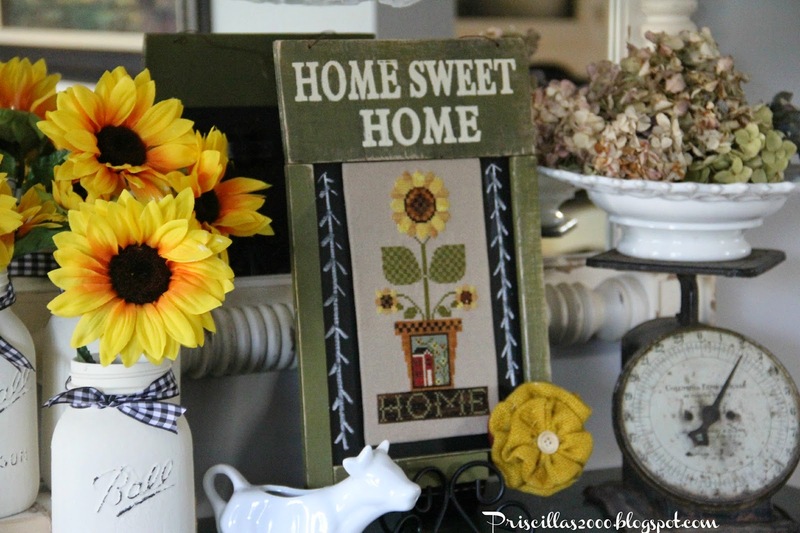 Love how you finished the sunflowers, another great idea. Your little guy looks like he's having fun!! Beautiful flowers and a lovely butterfly. Super cute, I love sunfolowers. Love that happy little grandson of yours--too cute! Super cute Priscilla. 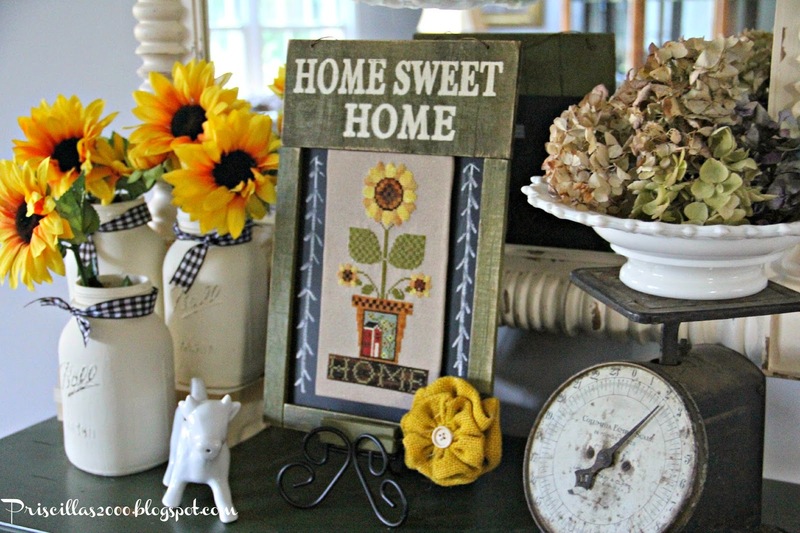 I love how you framed it! Super creative. The raspberry picker is a doll. I'd smile too, since raspberries are my favorite fruit. 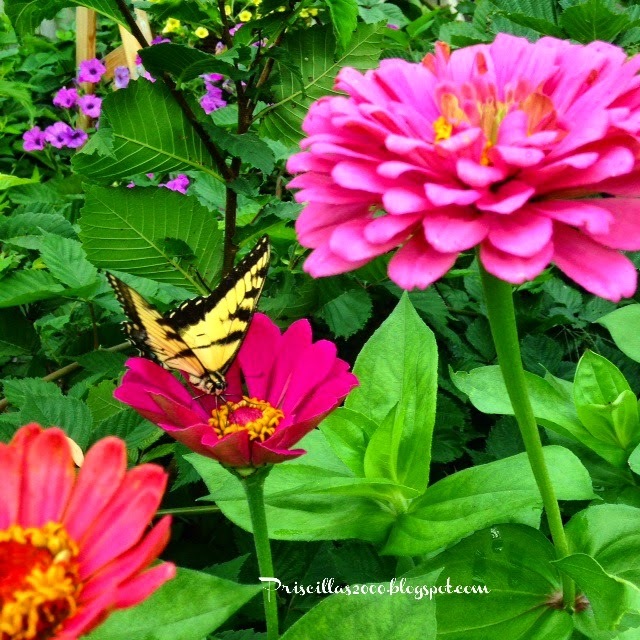 Beautiful photo of the Zinnias and butterfly! Thanks for sharing with SYC. Oh, I just love your stitchery piece! It does look so perfect in its new home. I use to do lots and lots of crewel and embroidery, but the eyes just aren't what they use to be!